You may have wondered if I’d forgotten how to blog. Such is not the case at all. I spent the last three days driving this 27 foot U-haul moving van and have not been able to post. Here is the van in profile. It is every bit as big as it looks. We made a decision last week to bring the rest of our belongings to Floyd so we wouldn’t have to pay another month’s rental on three storage units. 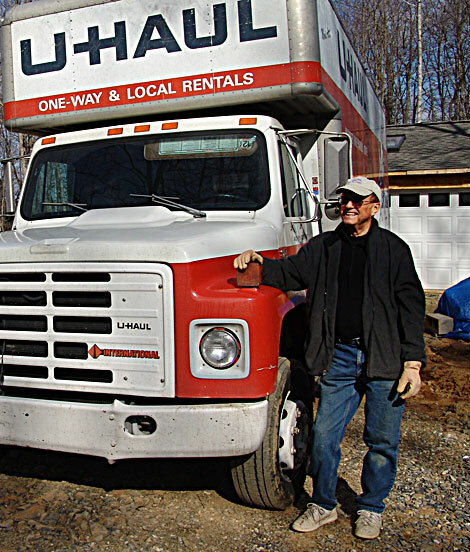 A round-trip rental of a U-haul moving truck was actually cheaper than a one-way rental. I picked up the moving van in Roanoke and managed to figure out the five-speed stick shift before I had gone too many blocks. After twenty miles of stoplights, I was up-shifting and down-shifting without having to think about it. The fact the my first leg would be driven empty made it much less stressful. The hardest part to learn was to allow enough room when I made turns or drove into a filling station. I didn’t hit anything, but I had a few near-misses until I got used to the width of the truck and the enormous turning radius. Finding stations that sold diesel fuel for trucks was another adventure entirely. You can’t just cruise into a station and check out the pumps when your truck is more than 30 feet long and requires 12 feet of overhead clearance. Several times I saw Diesel signs but the pumps were set up for automobiles and small trucks only. I finally found my supply of Diesel fuel by looking for beat-up filling stations with large driveways and high canopies. Once I knew what to look for, I spotted these diesel stations on the outskirts of every industrial area I passed. The loading and unloading of household goods went almost like clockwork. I had enlisted teams of helpers at each end of the run. It took three and a half hours to load the truck in Palmyra and three hours to unload the truck in Floyd. Driving back with a full load of household goods revealed every quirk of the old van. It had 239,000 miles on it and the steering was not as tight as it once was. After a while I got so I could anticipate how it would handle various road conditions, so it wasn’t as wearing as it might have been. The entire drive was done under severe wind conditions. The warnings from the weather bureau were not exaggerated from the damage I saw in the pine forests I passed. In one stand of pines, about 5 percent of the pines had been snapped off about a dozen feet above the ground while an equal amount had been blown over. The crosswinds were strong enough to sway the van so I watched my speed carefully. The trickiest part of the entire drive was negotiating the last few miles of country lanes. Winding roads that I normally flew over in the Dodge van required careful driving to avoid severe lurching in the moving van. The country lanes follow the terrain faithfully. Every bump, hollow and swerve are duplicated in asphalt. When you drive a large truck full of fragile equipment and furnishings, the road assumes a far more menacing aspect. My unfinished driveway presented the most formidable challenge of all. Several trenches have been dug across the drive for power, water and electricity. Every one of the trenches has collapsed to some extent because they were dug and refilled when the ground was frozen. Every subsequent thaw causes the earth to subside. Driving over these sunken trenches was the final test and fortunately nothing fell over or was broken. As I write this, all of our worldly goods have been moved to Floyd, everything has been stored away safely, and we are sitting in front of our fire surrounded by sleeping cats. We have weeks, perhaps months, of unpacking and finish work to do, but we have essentially completed this building/moving to a new home phase of our lives that began about four months ago. Thanks to all who have followed this adventure and have offered their best wishes and support. I hope that this narrative has been useful to those planning a similar move. We have put in a lot of hours but the results have far exceeded our expectations. We have learned a lot during this experience and hope that your moves go as well. If you have questions I have not answered, feel free to send me an email and I will do my best to get you a useful answer. Our future projects in our new home will appear in the category Country Living. Congratulations! Now, as you settle into your country home the next step is to begin shopping for a tractor 😉 Just kidding. Well, sort of 🙂 If you’re in the market for a lawn tractor then I’d recommend a JD 2210 with a belly mower and a front loader. I think the new model is called a 2305. The engine is placed low and the low center of gravity makes mowing slopes much safer especially with the 4WD. You can keep your driveway graded, haul firewood, and so on. Worth a look. Pricing in the $13K range but you can likely find used ones also. Congratulation on the final chapter of your move. Where you once were I am now. I followed your recommendation to use SmartMove for the trek from Hesperia, California but have not met with initial success. I was told that Floyd was out of their service area and they would have to leave the containers at OVERNIGHT in Blacksburg and I would have to unload them from the dock. I sent an email with the picture of your containers being offloaded as you described, but it was ignored. Can you help? Let’s hope that Doug isn’t setting the standard for unpacking time frames,I’d like to be done in less than a year (but I do love naps). I’ll need those helpers of yours to unload my Smart Vaults, scheduled to be delivered on Tuesday. However, I have to get the RV from Willis to Manassas by late Thursday morning so will probably have to head that way on Wed. afternoon to make the deadline. See ya soon. Timeframes? We don’t need no stinkin’ timeframes. True, it’s more than a year later and we still have boxes in the garage but, hey, we also have soom for one car.